Whether you are in London for a fun holiday or for an important business meeting, it would be best to book an accommodation that is situated in one of its central areas. As in the case of any great capital city, the best action is all gathered in the City, a Central London district. Known mostly for being a financial hub recognized on a worldwide level, you can also take advantage of its surroundings and visit the most popular touristic attractions. 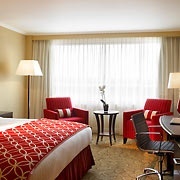 This can be done without stress and a lot of planning, by simply booking a central hotel, such as Marriott Twickenham Hotel. This accommodation is situated near important venues like Kew Gardens, London Eye, Hyde Park and Hampton Court Palace. It is also at an only 6 miles distance from Heathrow Airport, thus being the perfect solution if you are landing on this particular airport. With great facilities and prices, it represents a great option. In order to get a Heathrow to Marriott Twickenham Hotel Transfer by rail there is one main option: you could take the bus from Heathrow Central Bus Station (every 60 minutes) via Hounslow Bus Station (line 281 at every 10 minutes), followed by a 2 minute walk. This journey will take about 36 minutes in total. A Heathrow to Marriott Twickenham Hotel Transfer by car can be done by taking the Great South-West Rd/A30 Rd. Heathrow Airport is at a 6.6 miles distance from Marriott Twickenham Hotel. This journey will take about 18 minutes, without including traffic. A Heathrow to Marriott Twickenham Hotel Transfer with 247 Heathrow Airport Transfer is going to take about 33 minutes, including rush hour traffic. The price for a Heathrow to Marriott Twickenham Hotel transfer starts from 32 GBP.